There’s a gray, puffy blanket overhead from last night’s rainstorm. This otherwise doom & gloom weather is actually a welcome relief from the relentless heatwave we’ve been having. One look out the window and I had a shawl wrapped around my shoulders, making a beeline out of my stuffy cubicle. While I strolled past worn Victorian houses holding ground among modern office buildings, the sky spritzed a cool mist across my face. Fall isn’t officially here yet, but I’m anxious to sink my teeth into a delectable slice of Pumpkin Cake. 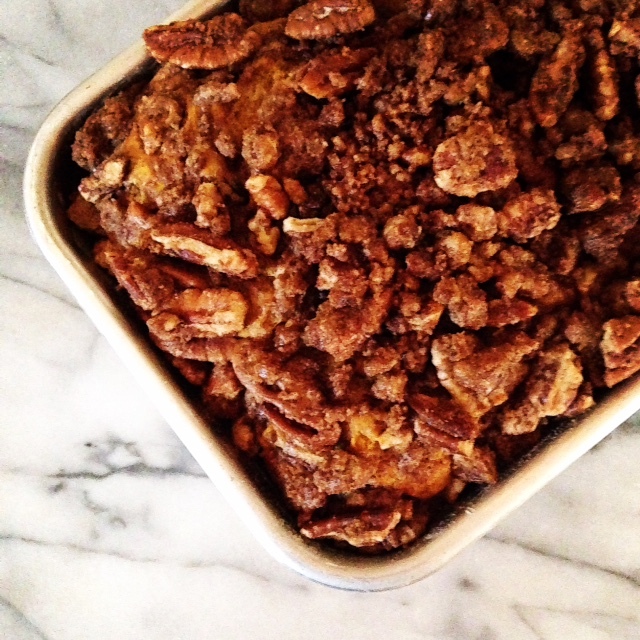 If Coffee Cake married Pumpkin Bar, this would be their love-child. Moist and airy with juicy raisins bursting under the tooth, it wraps you in the warmth of cinnamon and nutmeg, just in time for chilly weather. Spring is best known as the season of rejuvenation, when Nature wakes up with green leaves on branches and new life emerges from nests. Then, for some of us, Autumn represents renewal. With my birthday drawing near, I’ve been thinking about how I feel like a young girl trapped in a tired, old body. My little sweetheart inspired me to do something about it and, so, last night, I attended my first martial arts class. This may be construed either as a genuine effort to get fit or an episode of premature mid-life crisis. Whichever it may be, I feel broken today. Parts I didn’t know I had draw shrieks of pain. Baking has become my haven for relaxation and now in my achy post-karate form, it’s also my rehabilitation. It’s a somewhat selfish act that commands your full attention in producing something sweet and comforting, best served warm from the oven. The best reward are raves from those who sample the goods. Cake makes people happy. It’s a documented fact. Leaves turn bright shades of crimson and branches shake in the chilly breeze. A cool morning mist and the smell of wood burning in fireplaces fill the air. A new school year begins, full of promise and Nature’s bounty is ready for harvest. Along comes It’s the Great Pumpkin, Charlie Brown over the airwaves, best enjoyed with the little ones. A slice of Pumpkin Cake draws the day to a close as we retire for the evening with sweet dreams. Pumpkin Craze has taken the nation by storm….well, not quite…. but it’s coming. I’ll take pumpkin any day, any time of the year. Technically, Autumn hasn’t come yet, but I’m not waiting to bake something with pumpkin. First up is a moist, airy pumpkin cake with a buttery pecan crown. A pinch of coarse sea salt is a delicious surprise to the crispy, toasty streusel and compliments the sweet, nutty flavors beautifully. Whether you bake it into a couple of loaves, a bunch of cute little cupcakes or a big sheet cake, this recipe promises to convert even the most stubborn naysayers into pumpkin fans. Hope this chilly weather sticks around for a bit while so I’ll have more excuses to bake. « Gobble: Gourmet Dinner in 10 Minutes & $50 Coupon! You cake looks amazing and I find baking therapy too! I need to do more of it and maybe I would feel better! Happy Fall my friend! OMG! Divine. What a beautiful dessert to welcome the fall weather. Yes, Ma’am. I know you know good food and think this won’t disappoint you. Dear Colette, baking is indeed a form of therapy that we all seem to want to indulge in whenever suitable…love your thoughts in this post and how it all unfolds, the baking, the fall, the recipe, the comfort…now pass me a big chunck of your lovely pumpkin cake, please!!! Many hugs and kisses to you and little Daisy!